VATICAN CITY (Reuters) - Pope Francis shook up the scandal-plagued Vatican bank on Wednesday, removing four of five cardinals from an oversight body in a break with the clerical financial establishment he inherited from his predecessor. It was his latest move to get to grips with an institution that has often been an embarrassment for the Holy See and which he has vowed to either reform or close. The four cardinals were removed just 11 months into their five-year terms as commissioners, which began under former Pope Benedict, who resigned last February. 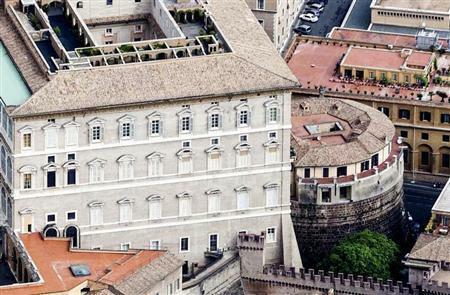 The changes came as Francis approached the first anniversary of a pontificate marked by austerity and sobriety, underlined by his decision to give up the papal apartments in favor of a modest suite. The new team includes two cardinals - Toronto's Thomas Christopher Collins and Vienna's Christoph Schoenborn - from relatively rich dioceses who have had extensive dealings with financial affairs. The others are Archbishop Pietro Parolin, the Vatican's new secretary of state, who will be elevated to the rank of cardinal next month, and Santos Abril y Castillo, a Spaniard who is based in Rome and is a close friend of the pope's. The one holdover was French Cardinal Jean-Louis Tauran. The four who were not re-confirmed included the former secretary of state, Cardinal Tarcisio Bertone. Commentators and some church officials blamed him for lax oversight that led to a spate of scandals during Benedict's pontificate, including the leaking of some of the pope's personal documents by Benedict's butler. Bertone has defended his record saying he was the victim of "anonymous accusations and rumor mongering". Cardinal Domenico Calcagno, head of another Vatican financial department that Italian magistrates suspect of financial irregularities and which the Vatican has asked an outside firm to audit, was also removed. Francis has not ruled out closing the bank, which is formally known as the Institute for Works of Religion (IOR), if it cannot be reformed. The cardinals commission reviews accounts and approves strategy. It acts as a link between the pope and the board of superintendence, which is made up of five lay members from around the world. The bank has undergone major changes since the arrival last February of its new president, Ernst Von Freyberg, a German. His team has closed many accounts and hired an outside firm, the Promontory Financial Group, to help it meet international standards of transparency drawn up to combat money laundering. An Italian investigation into alleged money laundering at the bank is still in progress. The bank denies the accusations. Last month, Moneyval, a monitoring committee of the Council of Europe, said the Vatican had made significant progress in financial reforms but still risked being used for money laundering unless it strengthened internal controls. Last July, IOR director Paolo Cipriani and deputy-director Massimo Tulli resigned, three days after the arrest of Monsignor Nunzio Scarano. Scarano, who worked as a senior accountant in the department headed by Calcagno, one of the cardinals removed and who had close contact with the bank, is currently on trial in Rome on charges of plotting to smuggle 20 million euros in cash into Italy from Switzerland.